We Get Ready for Christmas | Sprezzatura, Y'all! We’ve been invited to Michelangelo and Rosella’s for Christmas dinner and yesterday we went to help make the traditional Christmas cappelletti pasta. Cappelletti means little hat and that’s what these luscious stuffed pasta resemble. They will be served in brodo, in a broth, as the first course of the Christmas meal. The broth is a capon broth – it can be nothing else. Myra, I had another pasta making lesson. In this one, Rosella assumed I had absorbed all her knowledge from the first one and thought I was capable of producing something worthy of Christmas dinner. I appreciate her vote of confidence in my pasta making skills, but I didn’t share it. What if I messed it up? What if I couldn’t make the little hats correctly? What if I kneaded the dough too long? It was one thing when we were students and were eating the end product ourselves, but this was Christmas with Nonna (Rosella’s mother) and other family. Well, by the end of the night we were cranking out some pretty fine little hats. The dough was perfect and the stuffing was incredible. 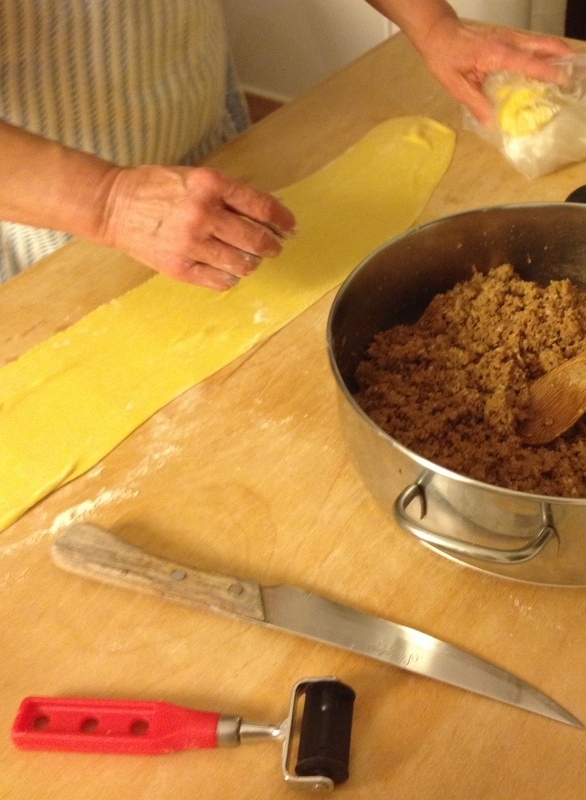 Cappelletti making is not for the faint of heart. This is serious work: standing, kneading, mixing, stuffing, shaping. First you make the filling which, in this case, consisted of sausage, turkey, beef, onion, celery, and carrot all cooked down with white wine. Then you grind it all up and put some more secret ingredients in that make it taste like a chorus of angels singing in your mouth (it’s Christmas, so that’s appropriate). 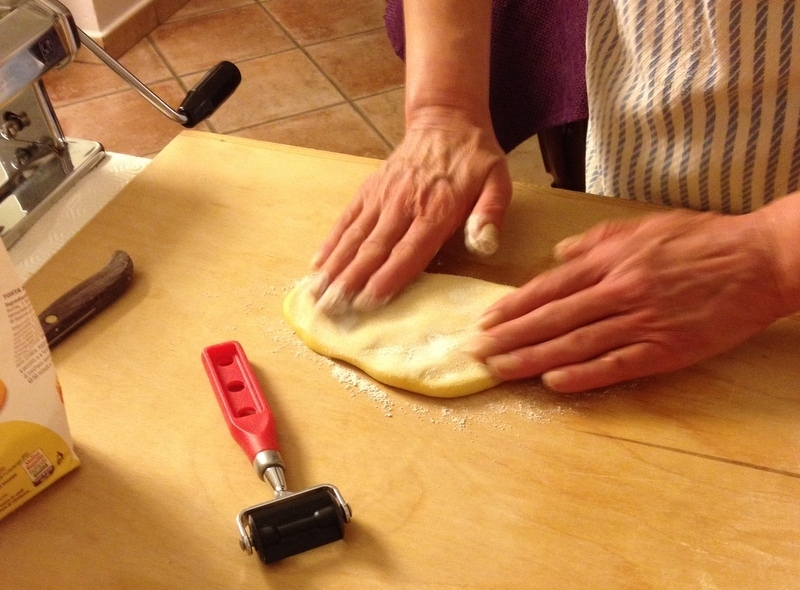 While that cooks, you make the pasta dough. I know what goes into the dough, but I don’t know the proportions. Rosella knows by feeling it and looking at it if it needs more flour or more water. She knows to start you need to figure out how many people and use a certain amount of flour per person and a proportional number of eggs to the flour. Then her instincts take over as she adds and feels and determines that it’s right. Then I take over kneading. I love to knead. There’s something very gratifying in taking a rough, jagged, sticky lump of dough and just by massaging it in the right way and for the right amount of time, you get a silky, smooth, soft dough. It takes a while to get it to this point, and I think this is part where I’ve always rushed it when I’ve tried making pasta in the U.S. You can’t rush it. It will come with time. Then it rests because it needs a break from all that kneading (and you do, too.) That’s when you have a margarita, a new Christmas prep tradition that I will happily incorporate into my routine. I look at the pasta and I look at the filling and I think this won’t take long. Ha! Cappalletti are little hats – the key word there being little. It takes a long time to roll, cut, stuff, and shape those little hats. We would make what I thought was huge amount and I would look at the remaining stuffing and pasta and it looked we hadn’t touched it. By the end of the night, we had finished and all the little cappelletti went into the freezer. I can’t wait till Christmas to taste the fruits of our labor. Another culinary masterpiece from Rosella! You will have to tell me about the brodo so I can add it to our recipe. Wish I were there to enjoy the little hats with y’all. It sounds fabulous in the brodo. Give them all a hug and a Buon Natale from me! Will do, Myra. Rosella kept asking me if you had made pasta yet! Buon Natale to you! D what a great cook you were ,but food will never be the same for you& Steve.I just can’t imagine how much fun all your cooking experiences have been!